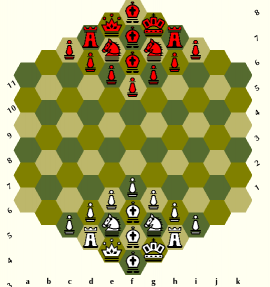 Alfaerie Variant Chess Graphics is a graphics resource. It is categorized as: Orthodox chess, . Alfaerie Variant Chess Graphics. Set of chess variant graphics based on Eric Bentzen's Chess Alpha font. Browse items that also start with the letters Alf. Alfaerie Variant Chess Graphics: Expansion Set 1. Set of chess variant graphics based on Eric Bentzen's Chess Alpha font. Author: David Howe. Alfaerie Variant Chess Graphics: Expansion Set 2. More Alfaerie graphics, plus a preview of the new Alpha Variant font. Author: David Howe. Alfaerie Variant Chess Graphics: Expansion Set 3. More chess variant graphics based on the Alpha chess font. Author: David Howe. Alfaerie Variant Chess Graphics: Expansion Set 4. More Alfaerie graphics! Author: Various. Alfaerie Variant Chess Graphics: Expansion Set 5. Many new designs, several shogi variant based pieces. Author: Various. Alfaerie Variant Chess Graphics: Expansion Set 6. Missing description By Matthew La Vallee. That's what it did. With this GIF, it used the actual size of the image. Maybe it chooses something like 150x150 for excessively large images. Let me get this clear: the WYSIWYG editor did decide on 150x150 all on its own, without you having to specify the height and width in the image-entry popup? Why did it pick 150? Does it do that for any image? Or just because it considered 2048x2048 ridiculously large? In hindsight it is a bit unfortunately that all the Alfaerie SVG have native size 2048x2048, just because the Chess-Alpha set from which I started happened to have that. 50x50 would have been more convenient. P.S. The board editor two comments down now generates more compact FENs, using the dressed-letter piece IDs rather than the parenthesized image names. Catch is that this requires the piece table for the diagram to be defined 'by hand', because there is no way to guess the required IDs from the image names. (Otherwise the script could just get the image names from the directory, which would make it easier to adapt to other piece sets.) I also put the Interactive Diagram there in 'position-setup mode', so that you can make multiple drops of a piece selected in the list. I used CKEditor's WYSYWYG mode to post the image, and it turns out that it set a size for the image without me realizing it. I am switching to Source mode to control the HTML. That is good news. How do you control the size, though? I understood the 'native' size of the Alpha set was 2048 x 2048 (and 100x100 for the XBoard pieces). In the pane above you can define moves of a piece by clicking the squares it should be allowed to move to. First click defines a leaper move to the square. A second click would convert this to a slider/rider move that repeats that step/leap. A third click would remove the move again. To limit the range of a slider you can click the first square along its path that it should not be able to reach. Clicking on the piece takes away all its moves, and thus clears the entire pane. After you are satisfied with the move, you can press the 'Assign Move' button, and then click in the piece table in the 'move' column of the piece you want to assign it to. On my PC, the image showed up on every browser I tested: Vivaldi, Chrome, Firefox, Internet Explorer, Safari, and Opera. Its aspect ratio was distorted in Safari, so that it was too short or too wide. But this is probably because the latest version of Safari that runs in Windows is old. It appeared fine in Safari on my iPad. Based on this, I expect SVG images to show up in any modern browser.